Tokyo Ghoul is probably one of the most phenomenal manga and anime series in US. Its story includes realistic, tragic, and somewhat horror elements and curiously, many readers are really into this type of storyline. 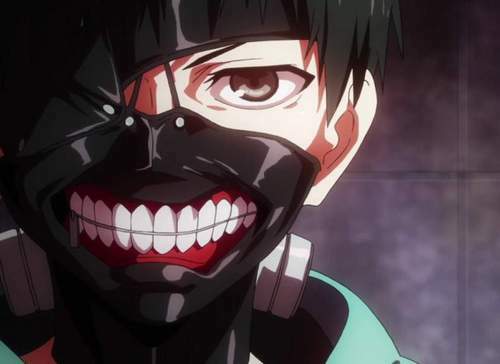 The Tokyo Ghoul series (currently there is a manga continuation named Tokyo Ghoul RE) has many intriguing and memorable characters, yet the most memorable is definitely our main protagonist: Kaneki Ken. Although not all readers like Kaneki Ken because of reasons, we can’t deny that his background and character development are interesting to follow. But most important of all, we are curious about the true extent of his power. Throughout the series, Kaneki often gets beaten and people partly hate him because of this “useless capability”. But in truth, how exactly strong is Kaneki Ken? Is he truly “useless”? Let’s find out! 1. What is Tokyo Ghoul? 3. How Exactly Strong is Kaneki? For those who haven’t read Tokyo Ghoul (yet interested in this article), Tokyo Ghoul (東京喰種, or Tokyo Kushu in Japanese) is a Shonen manga series written by Sui Ishida. The series began serialization on Weekly Young Jump by Shueisha in 2011 and ended in 2014. The sequel Tokyo Ghoul RE also started not long after the original series and it is still ongoing currently. 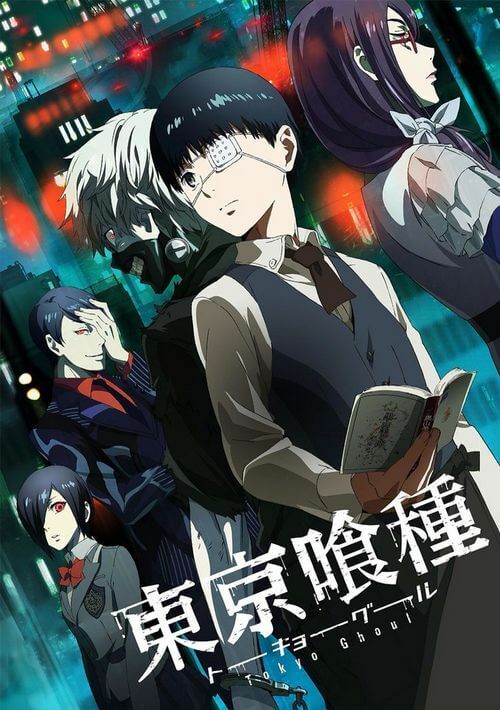 In 2014, an anime adaptation of Tokyo Ghoul by Studio Pierrot was released; however, it was not well received by readers and fans. Although this series initially classified as Shonen (manga and anime for male teenagers), it is more like Seinen (anime and manga for young adults) since later on the series contain tons of violence and tragedy. 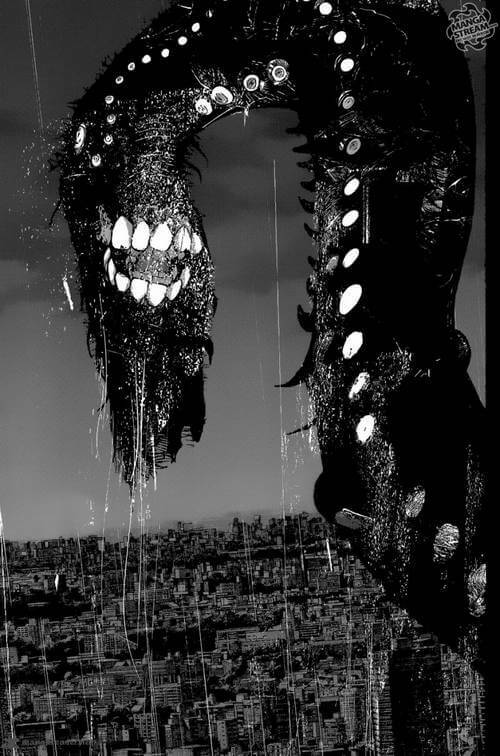 In Tokyo Ghoul Universe, there is a human-eating specie called “ghoul”. These “Ghouls” are considered as natural enemy of mankind and curiously, they share the same appearance as normal human and they can only eat human flesh. The only difference is that they possess red and black-pupil eyes, much higher physical strength than normal human, and more importantly: flesh weapons called “Kagune” (or “tails”). The Tokyo Ghoul story mostly takes place in Tokyo where Ghouls widely infiltrate and caused great disturbance in human society. To deal with such a great threat, an organization called Ghoul Countermeasures Bureau (CCG) was founded with sole purpose of investigating and hunting Ghouls. This organization includes tons of Ghoul Investigators specially trained to take down Ghouls. 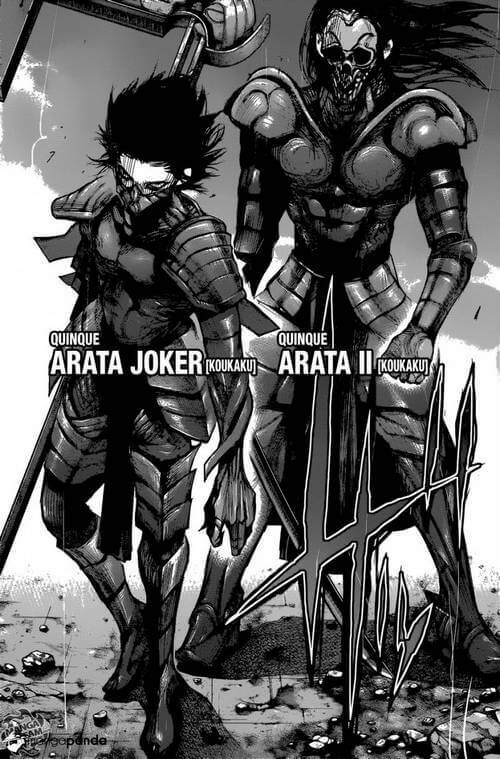 In addition, they use special weapons called as Quinque, crafted from Ghoul’s Kagune. These Quinque weapons are the only things with capability of killing Ghouls and like Kagune, they also have various types and abilities. The story of Tokyo Ghoul begun with a normal University student named Kaneki Ken. He has a timid, but kind personality, and he is extremely interested in books. 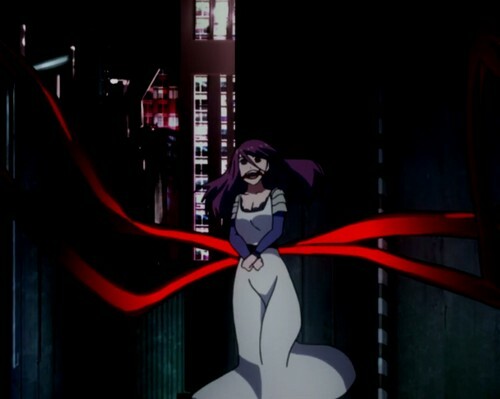 One day, he encountered a beautiful woman turned out to be a Ghoul named Rize. He was hunted by this Ghoul but “fortunately”; his life was “saved” by a steel beam accident. 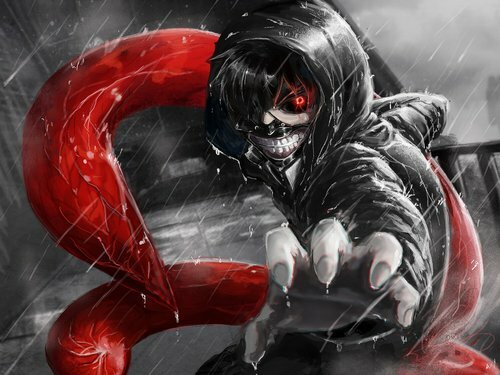 Kaneki got transplanted with the Ghoul’s organ, thus transforming him into an One-eyed Ghoul (half human, half Ghoul). Ever since, he has had to struggle with his life, both as a human and as a Ghoul. Throughout his life, he met various Ghoul friends with moral codes like Touka, Renji, Shuu, Nishio, Kuzen, and more… Together they helped Kaneki to balance his life. But that was still just a beginning of his lifetime journey as a Ghoul. 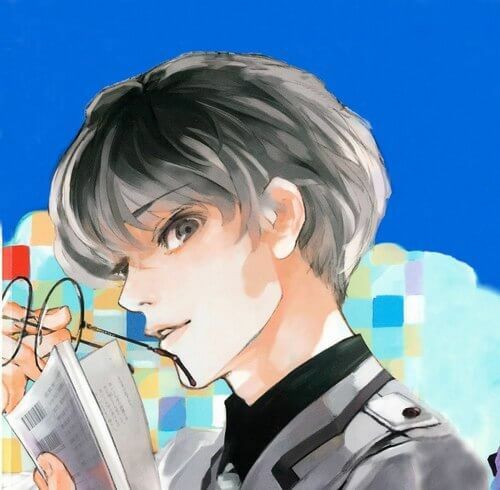 As mentioned, Kaneki was originally a normal human studying in University. However, due to an “accident”, he got transplanted and became a half-human, half-ghoul. Since then, he gradually got stuck in the Ghoul society and he has had to live through various painful events. In original Tokyo Ghoul, he worked in Anteiku café shop owned by a Ghoul named Kuzen Yoshimura. Kuzen, along with other fellow Ghouls helped Kaneki in controlling his inner Ghoul. During this period, Kaneki appeared to be a gentle, yet timid young man. Before becoming a half-ghoul, he had few friends and his only closest friend is Hideyoshi Nagachika. After his Ghoul transformation, he still maintained his timid and gentle personality, yet his fear of isolation and identity crisis grew larger. He desperately found a place where he could belong and fortunately, Anteiku was the place he could place his trust into. However, things gradually become hellish for Kaneki, especially when he was captured by a Ghoul organization called Aogiri. He was tortured, and exactly during this time his mentality started to become messing up. Frankly speaking, Aogiri is like a terrorism organization including lots of dangerous Ghouls and the infamous Ghoul leader – One-Eyed King. However, their true motive is still unknown until the events in Tokyo Ghoul RE. Back to Kaneki, when he was captured by Aogiri, a dangerous S-Rank Ghoul named Yamori (a.k.a Jason) tortured him both his mind and body. At this time, Kaneki’s personality got messed up again and his hair turned from black to white. Even though Kaneki successfully killed Yamori, his personality went darker and darker. After the Aogiri incident, Kaneki left Anteiku and continued his own journey since he thought it would be the best way to keep Anteiku safe. Yet, at the end of Tokyo Ghoul, Anteiku was raided by CCG and Kuren was defeated despite being a SSS-Rank Ghoul. Kaneki quickly returned to Anteiku but he was stopped by a “friend” Ghoul Investigator Koutarou Amon. And then later on, he was “killed” by the strongest CCG Investigator of all time – Arima Kishou. But it didn’t mean Kaneki’s story ended. In this next sequel, Kaneki Ken came back, not as a Ghoul but a Ghoul Investigator instead. He was trained under Arima Kishou and he became the leader of the new Quinx team – a group of Ghoul Investigators who could use the power of Kagune. At the beginning, Kaneki’s name changed to Haise Sasaki and he forgot everything about himself and his past. The only memory he had was his new life as Ghoul Investigator along with his mentor and comrades. Even though he forgot his past, his gentle personality was still intact and most importantly, his fear of isolation and identity crisis. That said; his life as Ghoul Investigator didn’t last long. During the Tsukiyama Family Extermination Operation, Sasaki’s memory came back. He remembered himself as Kaneki Ken along with his past. After this operation, Kaneki still worked in CCG under the name Haise Sasaki and he got the nick name Black Reaper. 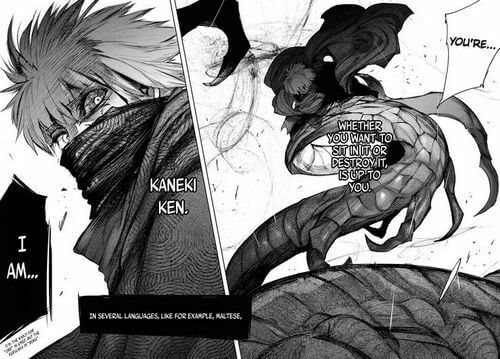 During the Third Cochlea Raid, Kaneki decided to “betray” CCG and fought for his old Ghoul friends. He battled with Arima Kishou and knew that he was chosen to become the One-Eyed King long time ago. Arima didn’t kill Kaneki (even though he had numerous chances to do that) since he wanted Kaneki to inherit his will. When he returned to his Ghoul fellows, he declared himself as One-Eyed King who would bring hope to the Ghoul race. He founded the Goat Organization with the goal to survive and find a way to coexist with mankind. In the latest chapters, CCG furiously attacked Goat’s hideout under the lead of the current CCG Chairman – “mad clown” Furuta, while Kaneki and his excavation team were on an expedition to check out the new hideout. Kaneki quickly returned to Goat’s hideout and once again he decided to be the “one-man-army” to stop Furuta’s force from exterminating other Ghouls. After a fierce battle with Juuzou Suyuza and his subordinate Hanbee Abara, Kaneki got his four limbs cut off while Juuzou and Hanbee were greatly injured. In his desperate moment, his mind imagined a “meeting” of different Kaneki Ken from a certain time of his life. They all decided that they had to live, eventually, Kaneki devoured the CCG force and transformed into a monstrous “Dragon”. At this point, the series still hasn’t ended yet and there will be lots of surprises in the future. 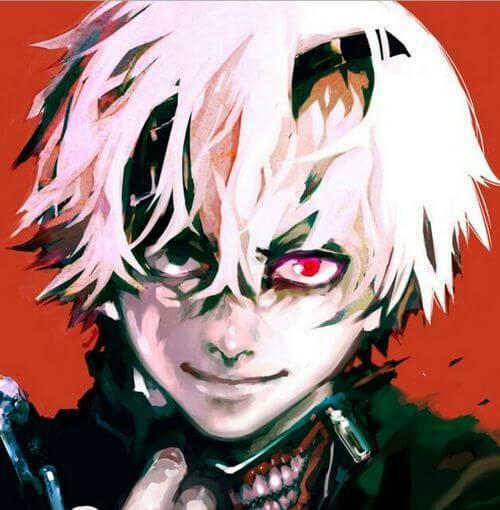 Kaneki Ken is somewhat… the most “controversial” protagonist among Shonen main characters. From the latest Tokyo Ghoul RE chapters, we can easily say he is definitely the strongest character in Tokyo Ghoul. However, his beliefs and complicated personality prevented him from showing the true extent of his power. His beliefs and mentality complex are also partly reason why he shares a great deal of hate from readers and fans. So, in terms of pure strength, how strong is Kaneki? At the beginning of Tokyo Ghoul, Kaneki is rather weak even among Ghouls. But this is understandable since it was the first time he experienced the life of a Ghoul and it required a considerable amount of time for him to accept his Ghoul power. 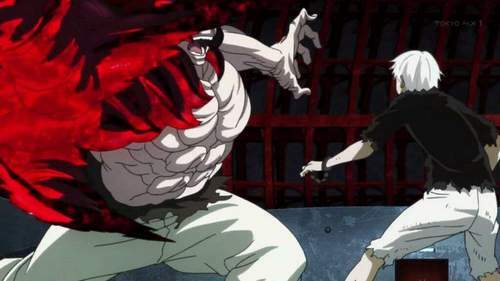 But his strength started to show its true power during his capture by Aogiri, typically when he got tortured by Yamori. Despite Yamori being a S-Rank Ghoul and capable of becoming Kakuja (a more powerful version of Ghoul), Kaneki defeated him and it looked quite easily for him. This mean Kaneki at this time is already stronger than a S-Rank Ghoul. Later on, when he left Anteiku, he ate tons of Ghouls to a point that he became a half-Kakuja. At this point his power was so dangerous that CCG rated his rank to be around SS-Rank. Despite this incredible feat of strength, he wasn’t able to defeat Arima Kishou and ultimate slain by Arima. When Kaneki fought as Haise Sasaki, his skill definitely refined more than ever. However, he still couldn’t defeat his old friend Nishiki Nishio (currently he is a S-Rank Ghoul under the alias “Snake”). But when Kaneki Ken personality came back to him, his insane strength returned once again and he was powerful as ever. When he devoured a part of Eto Yoshimura’s Kagune (she was a SSS-Rank Ghoul), definitely his strength grew even higher. In the Third Cochlea Raid, Kaneki fought Arima a second time and Kaneki triumphed victory this time. That said; he still wouldn’t win if Arima Kishou truly wanted to kill Kaneki. After his battle with Arima, Kaneki declared himself as the One-Eyed King and definitely he was the strongest Ghoul. And to some extent, we could say Kaneki was the strongest character in Tokyo Ghoul at the moment. Some may argue that Kaneki was weak and “useless” compared to other characters like Arima or Eto due to his defeat against Suyuza and Hanbee. However, we personally thought that Kaneki was still the strongest character. For those who have followed Tokyo Ghoul RE up to this point, let’s remember that Kaneki refused to eat flesh, both from human and Ghoul. Ishida also intentionally pointed out that Kaneki was weakened since he lacked RC Cells – a vital cell for Ghouls to maintain the body. This means that Kaneki could have easily beaten Suyuza and Hanbee if he accepted to eat flesh. In Tokyo Ghoul, we witnessed that Kaneki consumed lots of Ghouls and this act greatly increased his strength. And then in the recent chapters of Tokyo Ghoul RE, we could see his insane strength when he decided to eat CCG agents in his path. Despite his twisted mentality, no doubt his power when becoming “Dragon” is not something can be meddled with. So, if Kaneki is that powerful, why he still failed in both Tokyo Ghoul and Tokyo Ghoul RE? The answer is that his failure didn’t come from his pure strength, but rather his beliefs. There are two main problems we can say about Kaneki: his personality disorder and mainly, his desperate thrive of being “useful”. Fans of Tokyo Ghoul probably know this personality disorder of Kaneki pretty clearly by now. Basically, Kaneki often sees hallucination of various “Kaneki” inside him; each Kaneki represents himself from a certain time of his life. This insane mentality often occurs when he is in desperate situation, and every time it drives Kaneki further to madness. The most typical case of this personality disorder was when Yamori tortured him. He imagined Rize talked to him and told him to embrace his Ghoul side, thus made him became insanely powerful to defeat Yamori. But this also came with a toll when it marked the first step of descending into personality madness. In Tokyo Ghoul RE, this happened numerous times when he was Haise Sasaki. And especially after his defeat against Suyuza and Hanbee, he even imagined a meeting of “Kanekis” inside his head. Each of Kaneki in his mind represents himself at certain time. This also means that Kaneki couldn’t forget his past. The past always haunted him, especially the memory of his defeat and failures. He always tried to become “better”, to become more “useful” than he was in the past. Unfortunately, this thought put a heavy burden on his shoulders as he always tried to do everything by himself – fatal belief which cost him his life in the past and even now. Being “useful” isn’t something bad. Many of us tend to find our meaning in our life and wish to become useful for our dearest friends and family. However, being useful may become our destruction if we can’t forgive ourselves and when we only keep the burden for ourselves. This is exactly the problem with Kaneki Ken – a man desperately to be “useful”. 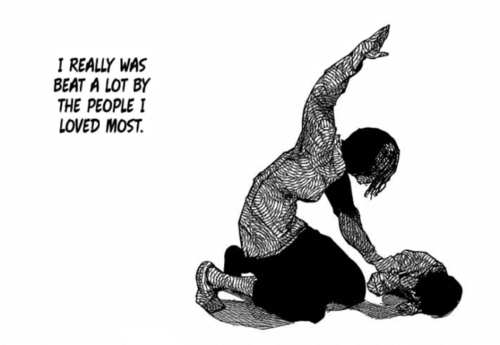 Everything started since his childhood when he often got beaten by his mother (from Tokyo Ghoul RE). This didn’t mean that his mother was bad; it was due to his family condition that his mother had to work intensively without rest. Each time he asked his mother for a favor, he got beaten. And gradually, he was afraid of asking his mother since he didn’t want to bother his mother’s work… until the day his mother died because of that very same reason. When his mother died, he lived in isolation which drove him to extreme thirst for friends and company. When he grew up and especially when becoming a Ghoul, he always tried to deal with thing alone. He wanted to become useful without bothering other people (doesn’t it sound familiar?). Also, he didn’t want to lose any of his friends since he detested isolation. Unfortunately for him, this is his greatest flaw. From time to time, it has proven that no matter hard he tries; he will still fail in the end. No matter how many small feats he has achieved, he would still lose in the final battle. 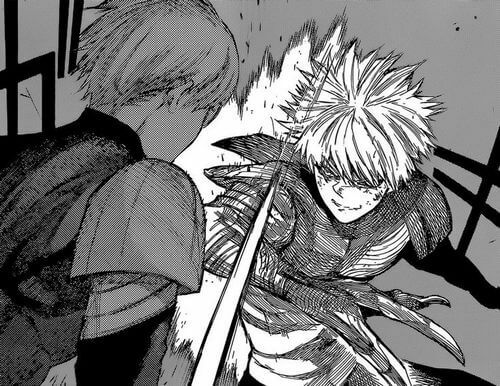 Typically during the final arc of Tokyo Ghoul, he charged into the fray to save Anteiku even though he knew it would be impossible. So what about the recent Tokyo Ghoul RE event? He came back to save Touka and Hinami alone even though he could call the entire expedition team back. Though it is unclear how things would play out if Kaneki returned to the hideout with his team, Furuta clearly stated that he hasn’t learned anything from the past since he keeps doing things all by himself. It seems to be more stubborn of Kaneki to repeat this pattern especially when his body is weakened due to the lack of RC Cells. Some people accused Kaneki of being too kind for not killing enemy and eating flesh. However, this was not always the case since at the time, Kaneki wished Ghouls to be able to coexist with human. And if he killed CCG agents then all of his progress for this peaceful future would be for naught. Therefore, it is hard to accuse Kaneki because of this act. On the other hand, certain readers believe that Kaneki wouldn’t win even if he brought the expedition team back. That said, at this point it is pretty clear that Ishida often values teamwork rather than individual strength (the only exceptions are Eto, Arima Kishou, and Kuzen). So if Ishida truly preferred Kaneki to follow this route, it would be possible that Kaneki’s team would win. But again, we still don’t know for sure if this possibility can truly bring out good outcome for Kaneki. As a man desperate to be useful, Kaneki Ken is complex, yet intriguing character. We have followed Kaneki since the beginning of Tokyo Ghoul and no doubt his character development is interesting to watch. Kaneki Ken is absolutely not an “useless” man. He is definitely strong and more powerful than we think. But to depict a realistic view, Ishida designed Kaneki not as a hero of faith, or a superhero who always win. He gave us a realistic protagonist with real-life issues, a character which is different from most of other main protagonists we often see in Shonen anime and manga. This is probably the reason many of us still follow the series: we want to see how things will turn out in the end, we enjoy the twists Ishida put in his beloved series. Sometimes we may hate Kaneki because of his “uselessness”, but doesn’t it the reason why we feel so attached to this character? And that’s it folk! What do you think about Kaneki Ken? Do you think he is useless? Feel free to share with us! But for now, thank you and stay tune for more news in the future!